According to Osha, indoor air quality inside offices and other workplaces is vital to workers’ comfort and health. Poor indoor air quality is linked to fatigue, eye irritation, headaches, trouble concentrating, and scratchy nose, throat and lungs. Dirty equipment becomes over-heated, posing a fire hazard and risking damage to the equipment. Keep office equipment dusted by professional office cleaning companies that understand it’s important to dust behind sensitive equipment like computers and printers. If you have clients that come into your office, you should hire professional office cleaning services to keep things tidy and neat. The appearance of your office, just like the appearance of your staff, reflects on the perception visitors have of your business. Increased productivity comes from employees who are comfortable and confident that their work is valued. If they can’t count on a sanitary and clean workplace, they aren’t likely to stay very long. Whatever money you spend on professional office cleaning comes back in the form of lower turnover and training costs as retention rises and tenured employees become increasing productive. They may suggest cleaning the carpets to begin with and then cleaning them again once a year to cut down on dust and allergens. Many office managers forget to ask about furniture cleaning service, which can be done cheaply as an add-on to annual carpet cleaning. 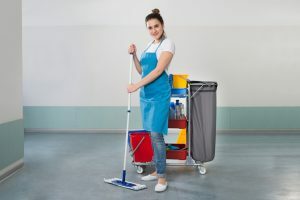 When you hire a profession office cleaning service, interview them first to see how they approach cleaning a business daily. A professional cleaning service should clean the entire office every day, with certain tasks done intermittently. If you have a smaller office, you can get away with cleaning three days a week if the bathrooms and trash don’t become an issue. For the sake of customers and staff alike, you need to be vigilant that your restrooms and are spotless. Your professional office cleaning service should clean the urinals, floors, mirrors and toilets every day as well as ensure the trash is empty. Nothing is more disgusting than grimy counters and nasty toilets, both of which can lead to illness. A clean bathroom is a first-rate way to boost productivity. Carpets are great places for dust and allergens to hide, especially if they are dirty. Your cleaning service should vacuum daily. This has a double payoff in that a clean carpet improves appearances and may increase worker productivity. Empty trash bins daily. Your employees throw just about everything in their trash. No matter how many office memos you send out, people can be a bit disgusting. Therefore, the trash, and all the funky smells and germ-laden tissues must go out every day. Clean your entry door windows making sure to remove all hand and finger prints. Pay attention to the ceilings, air vents and corners. Ask your professional office cleaning service to remove any hanging dust bunnies.